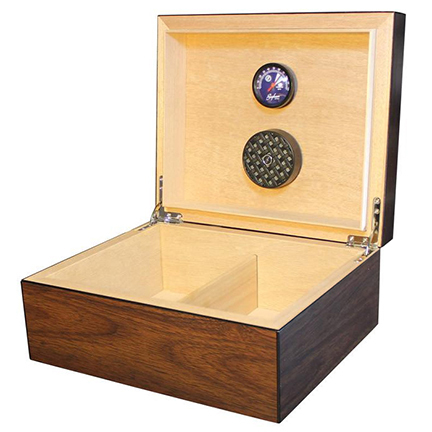 Milan Tobacconists offers a wide variety of fine cigar accessories, such as the cigar humidors shown below, for the discerning smoker at reasonable prices. 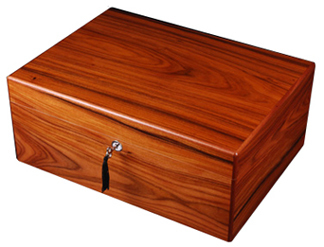 Only our most popular cigar humidors are listed here. If you are unable to easily locate a particular accessory, please give us a call at 877.70MILAN or send an email to customercare@milantobacco.com. We'll do our best to make a match! 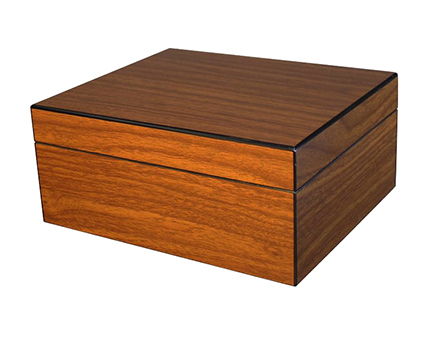 Brigham's Equinox cigar humidors are economical and the perfect size to keep on a boat, at the cabin, or on the corner of your desk. These 50-cigar humidors are equipped with premium components to ensure your favorite cigars are stored in optimum conditions and they're backed by a lifetime warranty. Craftsman's Bench Deluxe Series cigar humidors feature the fine quality and value that have made Craftsman's Bench a top selling brand in America, offering a luxurious look and feel with many enhancements to improve the proper humidification and storage of your cigars without breaking the bank. Craftsman's Bench is a division of J.C. Newman & Company, one of America's oldest family-owned premium cigar makers. 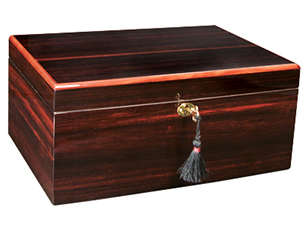 The beautiful look of exotic burled wood covering the Glenwood cigar humidor suits both traditional and eclectic decors. 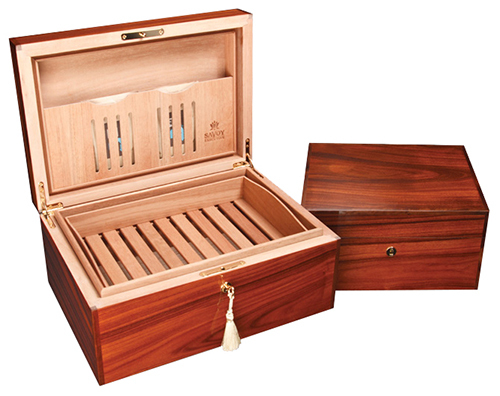 Featuring a removable divider, humidifier, and hygrometer, the Spanish cedar-lined Glenwood accommodates up to 25 cigars. 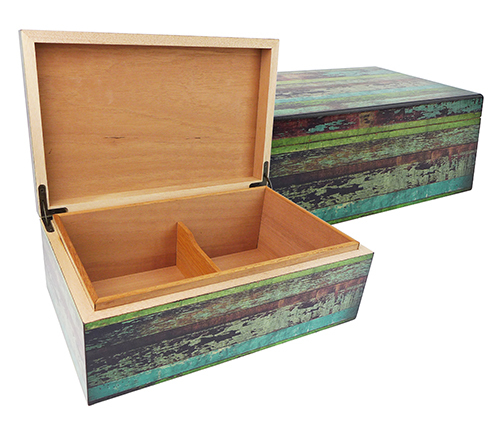 Dimensions = 8 1/2" x 9" x 3"
Bringing to mind windswept beaches, the Key West humidor's look of coastal reclaimed wood is accented with a rich dark chocolate border giving the humidor a very distinctive and stylized feel. Lined with Spanish cedar, this large humidor holds up to 90 cigars and includes a removable divider, humidifier, and hygrometer. Dimensions = 13 1/2" x 8 1/2" x 5"
Diamond Crown is one of the most respected brands in the cigar industry due in large part to its rigid quality standards, commitment to consumer satisfaction, tradition, and excellence. 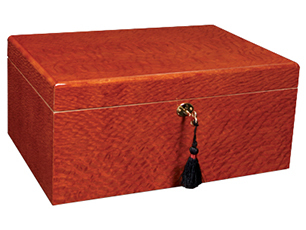 The American Series humidor collection reflects traditional styling and meticulous craftsmanship. 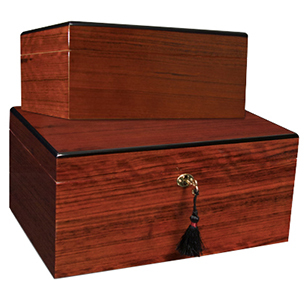 These classic, handcrafted solid wood humidors offer heavy duty construction found in fine quality furniture and include the newest Diamond Crown humidification system and adjustable digital hygrometer. 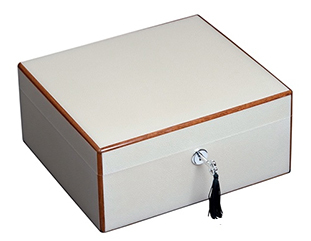 Each humidor is carefully packed in a custom felt storage bag. The Delaware cigar humidor features traditional styling and a cherry finish. Made from 100% solid cherry hardwood, the Delaware is accented with beveled edge details. 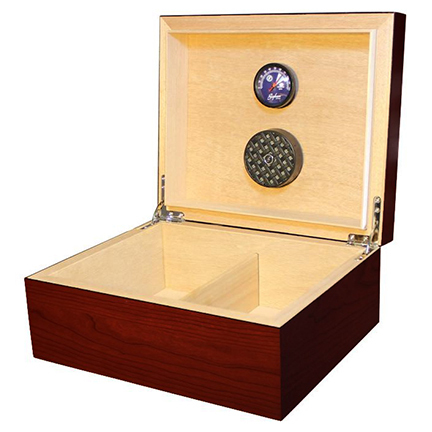 Each Delaware humidor accommodates up to 40 50-ring gauge cigars and includes the newest Diamond Crown humidification system and adjustable digital hygrometer with clean IMAS® attachments. Cigars not included. Dimensions = 13" x 8 1/2" x 3 1/2"
Diamond Crown is one of the most respected brands in the cigar industry - respect earned from its marks of distinction: rigid quality standards, commitment to consumer satisfaction, tradition, and excellence. 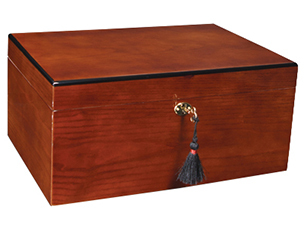 The St. James Series humidor collection offers superb classic styling and meticulous craftsmanship. 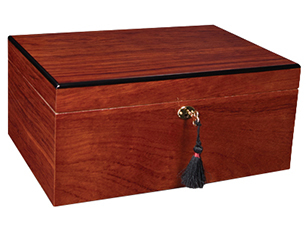 Each St. James Series cigar humidor is handcrafted at the level of fine quality furniture, featuring tongue and groove detailing, 11/16" wall thicknesses, high quality quadrant hinges for easy movement and transition, and then carefully packed in its own custom felt storage bag. The Alexander is wrapped in an exotic Black Ebony detailed with dark accents. 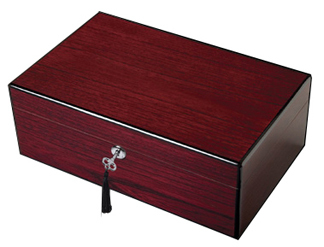 The elegant design of this humidor paired with a luminous high-gloss finish makes a handsome addition to any decor. The Alexander includes the new Diamond Crown Humidification System and Digital Hygrometer with IMAS® (invisible magnetic attachment system) to maintain optimum conditions; quadrant hinges; silver tone custom lock and key; Spanish cedar interior; and lattice aeration racks in the large models to increase airflow. Holds up to 40 cigars. Dimensions = 9 7/8" x 8 5/8" x 4 3/8"
Dimensions = 14 1/4" x 9 3/4" x 4 1/4"
The Drake features a lush Brazilian Rosewood design. 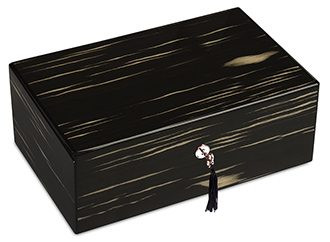 The elegant wood grains of this exotic species are enhanced by a satin finish. The Drake includes the new Diamond Crown Humidification System and Digital Hygrometer with IMAS® (invisible magnetic attachment system) to maintain optimum conditions; quadrant hinges; silver tone custom lock and key; Spanish cedar interior; and lattice aeration racks in the large models to increase airflow. The Oxford features a Brazilian Rosewood high gloss finish with handsome black accents. The Oxford includes the new Diamond Crown Humidification System and Digital Hygrometer with IMAS® (invisible magnetic attachment system) to maintain optimum conditions; quadrant hinges; silver tone custom lock and key; Spanish cedar interior; and lattice aeration racks in the large models to increase airflow. The Mozart is a visual symphony in high gloss ebony and ivory piano wood veneer. The Mozart includes the new Diamond Crown Humidification System and Digital Hygrometer with IMAS® (invisible magnetic attachment system) to maintain optimum conditions; quadrant hinges; silver tone custom lock and key; Spanish cedar interior; and lattice aeration racks in the large models to increase airflow. The Peabody's off-white pebble grain texture and high-gloss sheen is highlighted with a light wood edging that results in a stunning design not often seen in cigar humidors. The Peabody includes the new Diamond Crown Humidification System and Digital Hygrometer with IMAS® (invisible magnetic attachment system) to maintain optimum conditions; quadrant hinges; silver tone custom lock and key; Spanish cedar interior; and lattice aeration racks in the large models to increase airflow. The Windsor features an African Bubinga high-gloss finish with handsome black accents. The Windsor includes the new Diamond Crown Humidification System and Digital Hygrometer with IMAS® (invisible magnetic attachment system) to maintain optimum conditions; quadrant hinges; silver tone custom lock and key; and Spanish cedar interior. 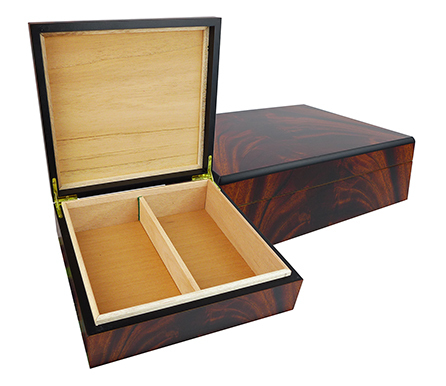 Savoy cigar humidors are beautifully crafted with exotic wood veneers and fragrant Spanish cedar interiors, yet they're very economical. Premium materials and meticulous construction merge to provide the most favorable conditions for aging and maintaining your cigar collection, and Milan Tobacconists goes one step further to enhance those conditions by including the Ashton humidification system at no extra charge. Holds up to 25 cigars. Ashton humidification system and cedar dividers are included. This size humidor is not equipped with a lock. 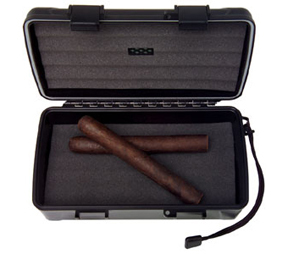 Dimensions = 10 1/4" x 8 5/8" x 4 1/2"
Holds up to 100 cigars and is equipped with a lock. 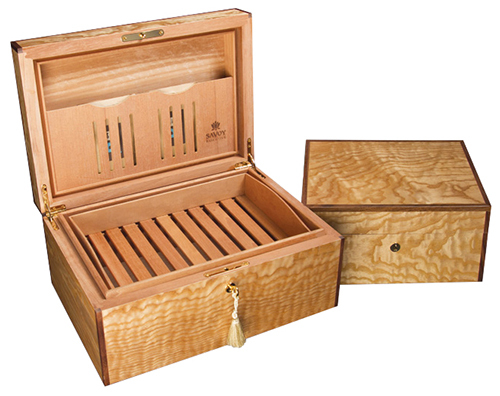 Ashton humidification system, cedar tray, and cedar dividers are included. 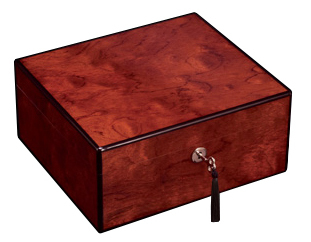 Dimensions = 13 1/2" x 9 1/2" x 6 1/8"
Savoy is synonymous with well-made, well-priced cigar humidors, but even they have stepped it up several notches with the introduction of the Executive Series. 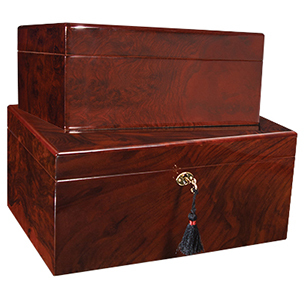 Featuring a beautiful selection of high quality wood veneers over fragrant Spanish cedar interiors, the Savoy Executive Series "aging chests" spare no luxurious detail ~ dovetailed corners, brass piano hardware, and SureSeal technology to name a few. 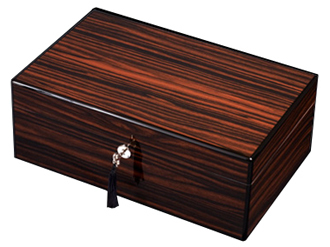 The superior craftsmanship of the Executive Series humidors combined with Savoy's trademark quality and value move the company into the premium humidor market without question. Boveda packs are included with your Savoy Executive cigar humidor. Boveda packs are rated for a certain humidity level using a specially prepared saturated solution of pure water and natural salt contained within a water vapor permeable reverse osmosis membrane. Simply place the correct number of Boveda packets inside your Savoy humidor to maintain a precise relative humidity. Boveda Packs are not refillable, but they will last approximately 2 months in an average cigar humidor. Holds up to 25 cigars. Includes cedar dividers, two 84% and two 72% Boveda packs. Equipped with lock and two keys. Holds up to 50 cigars. Includes cedar tray, cedar dividers, and four 84% and four 72% Boveda packs. Equipped with lock and two keys. The exterior of this handsome cigar travel humidor is covered in bonded leather with contrast stitching and secured with a tan accent strap and chrome-finish magnetic clasp. 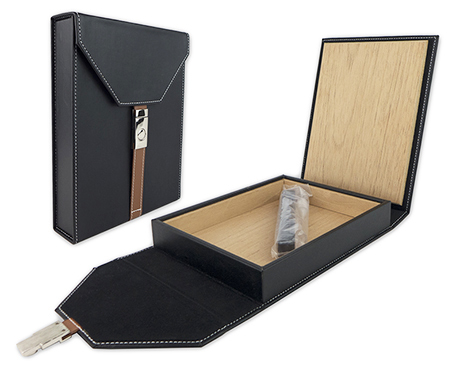 The interior is cedar-lined and a humidification device kit is included to help ensure your premium cigars are properly maintained during your travels. 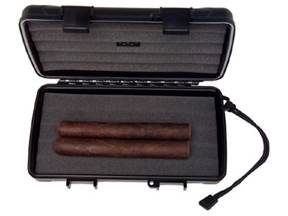 The cigar travel humidor comfortably accommodates 7 cigars and is available in black only. 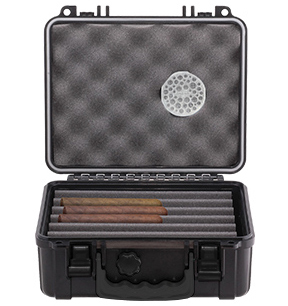 Rest assured knowing that from the den to the golf course or boat, your cigars will be protected in style with a Milan Tobacconists cigar travel humidor by XIKAR. Good cigars deserve special care  and XIKAR has designed the best storage products no matter your budget or collection size. 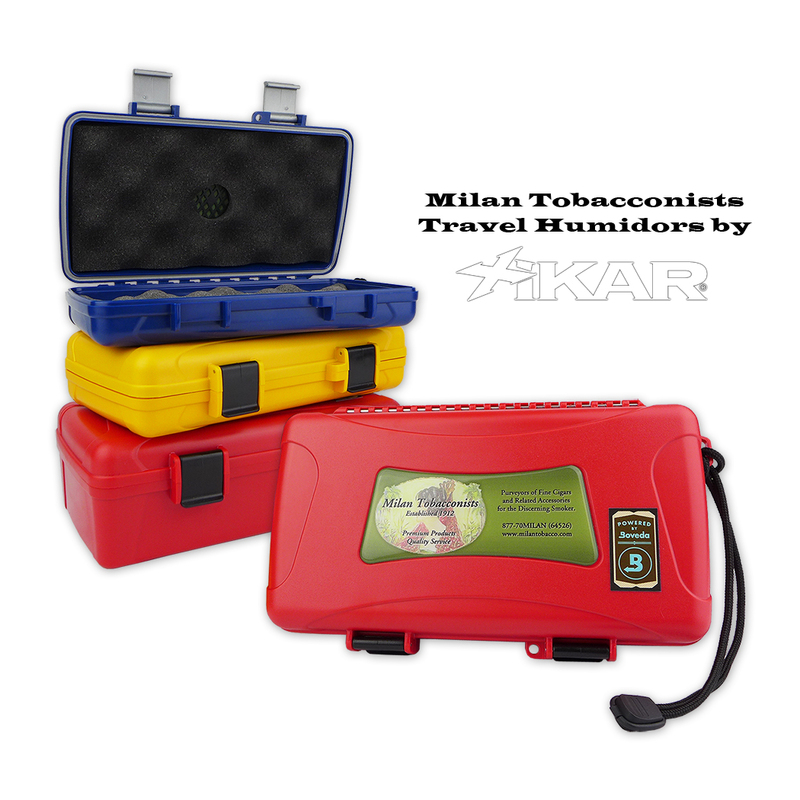 Take your favorite cigar anywhere on earth in Milan's indestructible ABS molded plastic travel humidors by XIKAR. 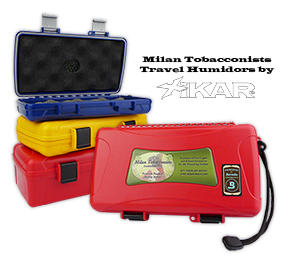 Airtight, watertight, and crushproof, the Milan travel humidor is equipped with a mini humidifier (with the exception of the red 10-cigar humidor which comes with a Boveda humidification packet), high density urethane foam to cradle and protect your cigars, and a locking clasp. These travel humidors are made in the USA with a lifetime guarantee. Protects up to 5 Churchill length cigars. Available in black, yellow, and blue. 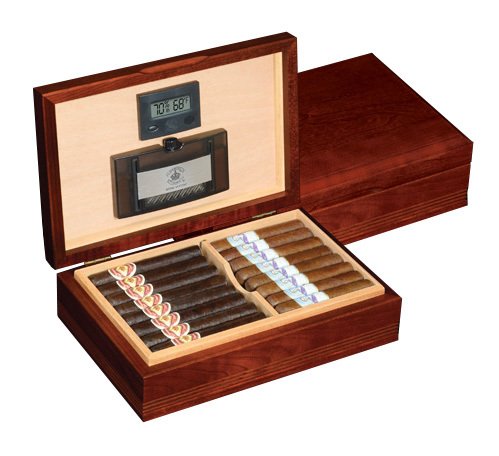 Inside Dimensions = 7-7/8" X 3-13/16" X 1-1/2"
Outside Dimensions = 8-3/8" X 4-3/8" X 1-7/8"
Protects up to 10 Churchill length cigars. Available in black and red. 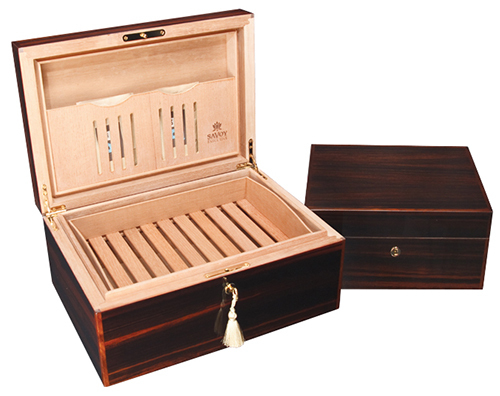 Inside Dimensions = 8" x 4" x 2-1/4"
Outside Dimensions = 8-1/2" X 4-1/2" X 2-3/4"
Protects up to 15 Churchill length cigars. Available in black only. 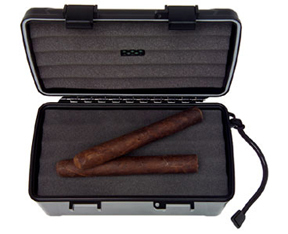 Inside Dimensions = 7-7/8" X 3-13/16" X 3-5/8"
Outside Dimensions = 8-3/8" X 4-3/8" X 4"
Protects up to 24 Churchill length cigars. Available in black only. 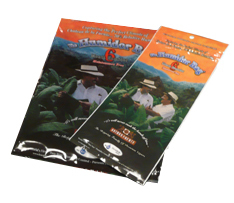 Outside Dimensions = 9" x 8" x 4 7/8"
The Humidor Bag by Humidipak is a high-barrier laminated bag with a resealable zipper. It's an inexpensive and totally maintenance-free solution for storing and aging your fine cigars. Imagine having a portable product that takes all the "worries" and guesswork out of maintaining your fine cigars. The Humidipak prevents loss of essential oils in your cigars by continually responding to the changes in temperature and climate. By responding to the outside atmosphere, the Humidipak eliminates even the slightest fluctuations in humidity for six months from the time the bag is first opened. This means that you can now have the confidence to know, for sure, that your cigars are stored (and aging nicely) at a precise 70% RH, without fluctuations. After 6 months of use, simply discard it. Size: 4 1/2" x 10 1/4"
Size: 8 1/2" x 10"